I don’t do many sponsored posts, but for Tex-Mex? Ummm… That’ll be a hard yes, por favor and gracias. Taco Bueno has a new menu item available, and they are almost as excited for everyone to sample it as I was to do said sampling. Next to perfect coffee every morning, really sweet watermelon as often as possible during watermelon season, and homemade popcorn during movies, Tex-Mex is my favorite food. I mean… salads, really. But obviously there is so much overlap there! OB-viously. Anyway, growing up in Oklahoma and traveling a lot to Texas has made my life pleasantly nourished by excellent Tex-Mex. I crave it constantly. 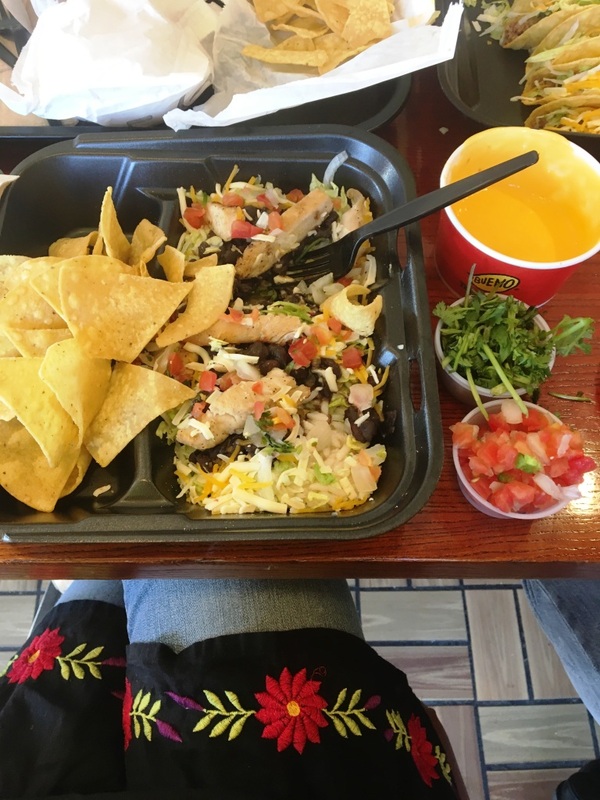 Taco Bueno is my favorite fast-casual place to satisfy that craving, too. So the nice folks at Taco Bueno sent me a generous gift card to try their new menu item. 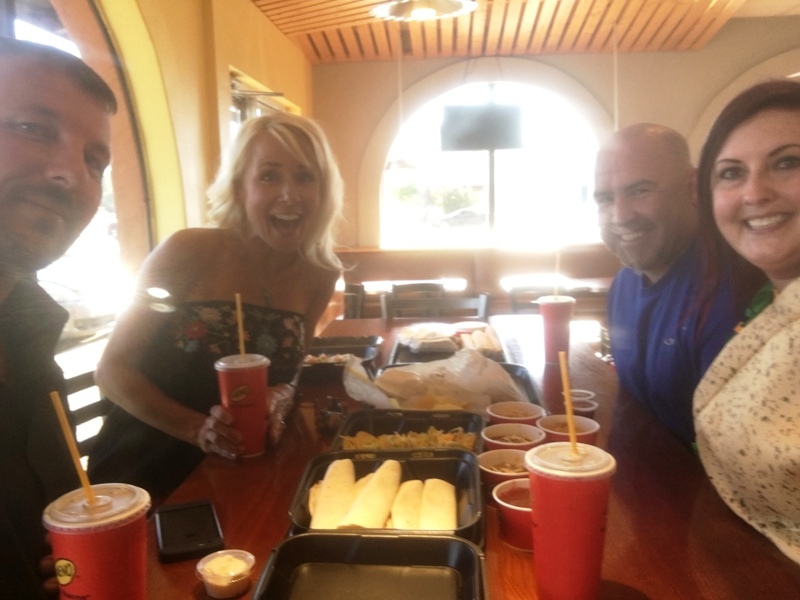 For our sampling fun I knew exactly who to invite: Brad & Mer, our Taco Tuesday power couple. We love being friends with them for lots of reasons, including the facts that they LOVE to eat and they LOVE to laugh and they LOVE to dress up for all sorts of fun occasions. A couple of years ago they showed up to a Cinco de Mayo double-dinner-date wearing the best costumes ever. Brad donned the biggest straw sombrero I have ever seen (outside of a birthday song attack), and Mer, well… See for yourself. I did not even have to ask her if she would wear the Taco again. It was just an understood. On to the food! Taco Bueno already has a pretty legit fast-casual menu. Years ago I could inhale the “B.O.B..” which stood for “big ol’ burrito.” More recently my favorite menu item has been the grilled chicken taco salad bowl (it includes black beans and cilantro rice). When we eat in rather than take out, I thoroughly enjoy their salsa and relish bar. It almost always includes fresh pico de gallo, which is my jam. Pile it on! 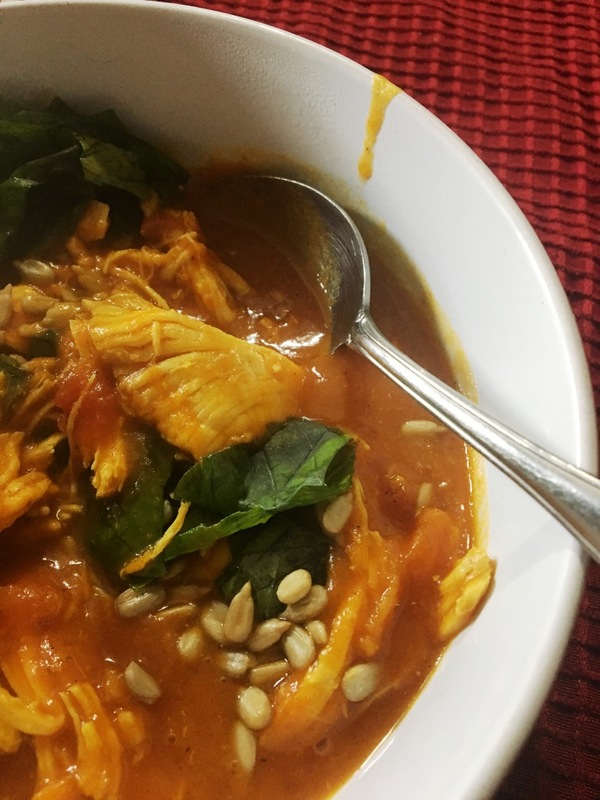 The new menu item is big and designed to feed either a small crowd or one perpetually hungry runner (with possible crumbs left for her husband and costume-wearing buddies). It’s called the “Wholotta Box” and it is no joke. The four of us opted to mix it up between tacos and burritos, plus I ordered that salad you see above (so good! ), we added an order of queso, and I think there were a few small items added on, too. We had way too much food. Everyone ate plenty and enjoyed every bite. We settled in at one of those long, high tables and laughed and laughed for about an hour. A good time was had by all, and we left with food to spare. My husband kept saying, “All of this was only ten bucks?” The Wholatta Box is, indeed, only $10. That’s a pretty great deal, friends. I feel like mentioning that we noticed several people leaving the restaurant with their own Wholatta Boxes to go, and how nice it seemed to have all that food packaged neatly in pizza-style cardboard boxes. Great for carrying home, you know? Ours was served just as neatly but in Styrofoam boxes for eating in. As if our fun with Brad and Mer wasn’t enough, Taco Bueno wants you to go try something delicious, too! Enter to win a $25 gift card then go feast. 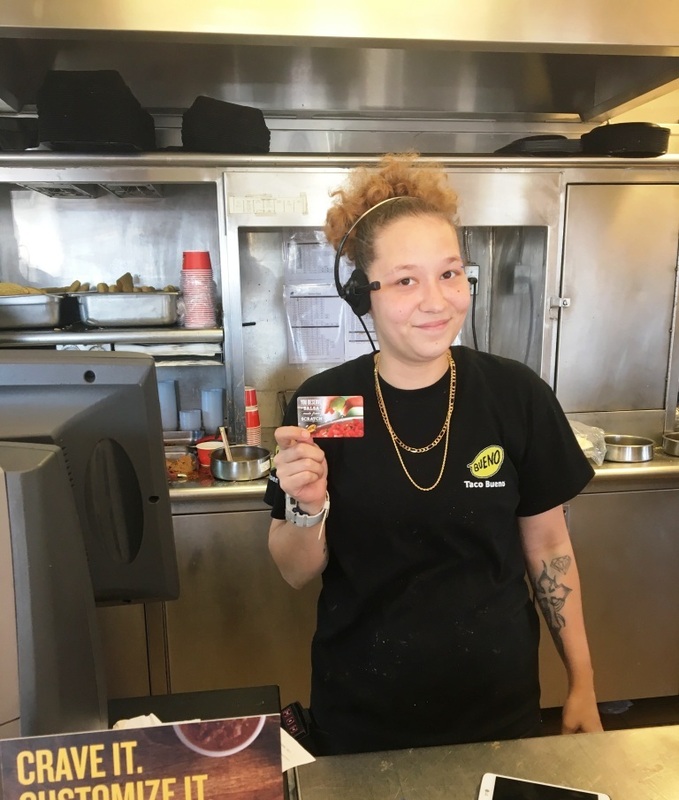 I have no doubt that your delicious visit to Taco Bueno will be made even better by great service like what we enjoyed from Heather, the young woman pictured above. She was patient with our antics, friendly to the max, and even posed for photos at our childish insistence. 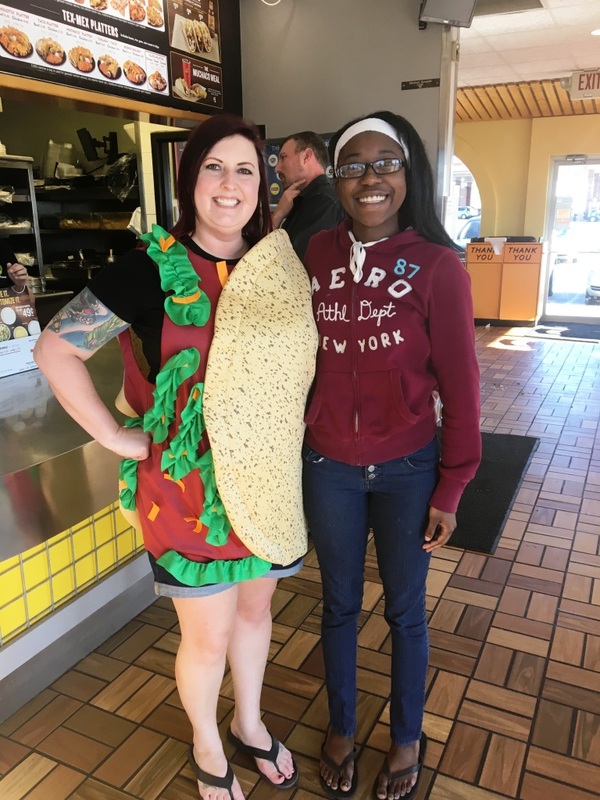 When our order was ready, she called out “TACO!” and everyone laughed. I mean, WE laughed. The other guests in the dining room who just wanted some food, man, looked around nervously. We heard someone stage-whisper, “That’s a real live taco!” Follow that train of thought at your own peril. So enter to win a gift card! Comment below, and just for fun tell me your favorite Tex-Mex food. I will choose a winner at random on Tuesday, May 30th. TACO TUESDAY! 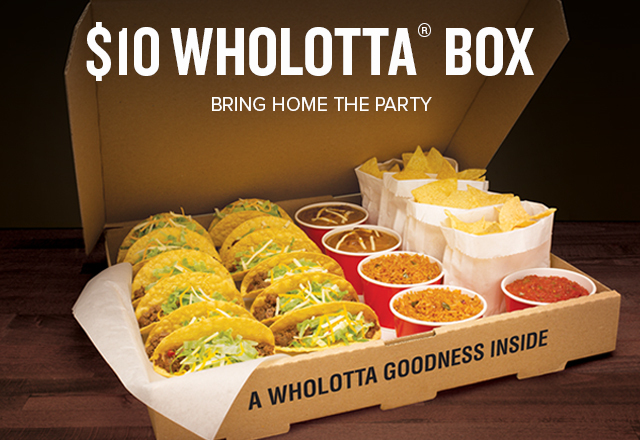 I hope you go try the Wholotta Box. 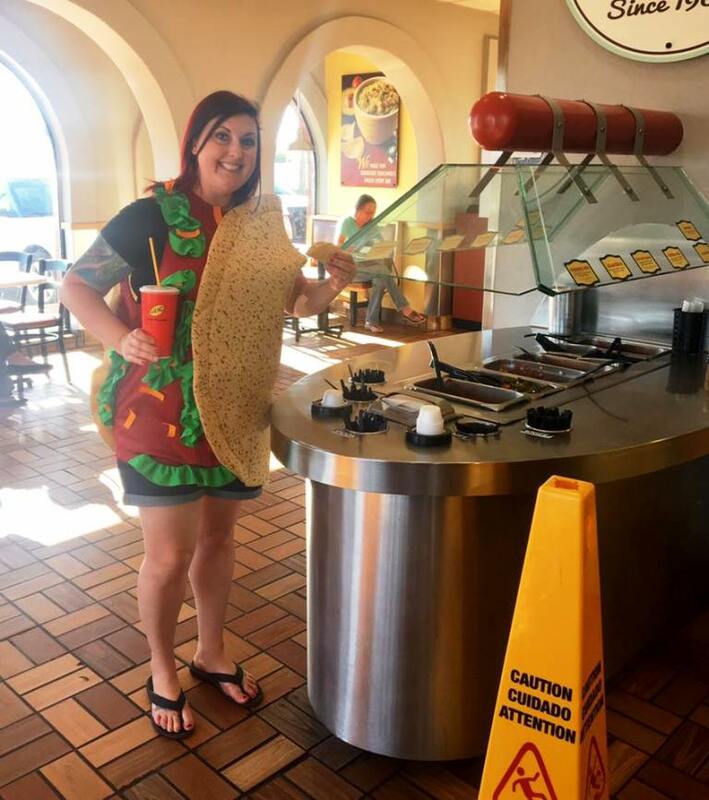 Bonus points if you wear a taco costume like my friend does, literally every chance she gets. Happy Friday!! Lots to celebrate over here. Lots of good stuff to press again into our flesh so it becomes more a part of us. Yesterday I got to nourish my soul as much as my body by gobbling up two hours of top-shelf conversation with my cousin Jen. Actually our moms are cousins. More importantly, we are friends and have been since we were little girls. 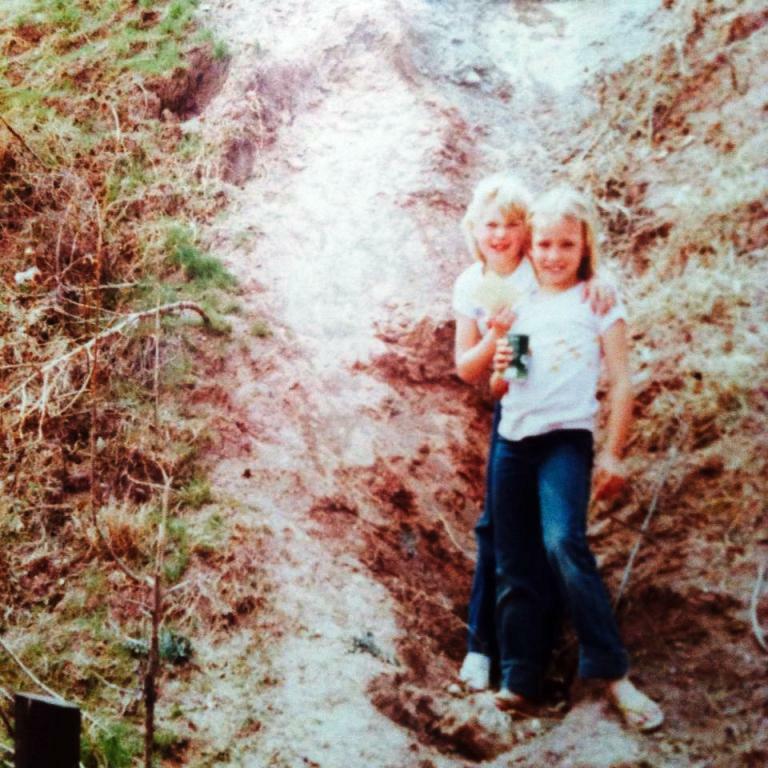 Jen and me at Roman Nose state park, circa the 80’s. Climbing rocks in flip flops? Since this is a food post, I will tell you that I clearly remember eating cottage cheese with pineapple that day, on a bed of lettuce. We also roasted hot dogs. 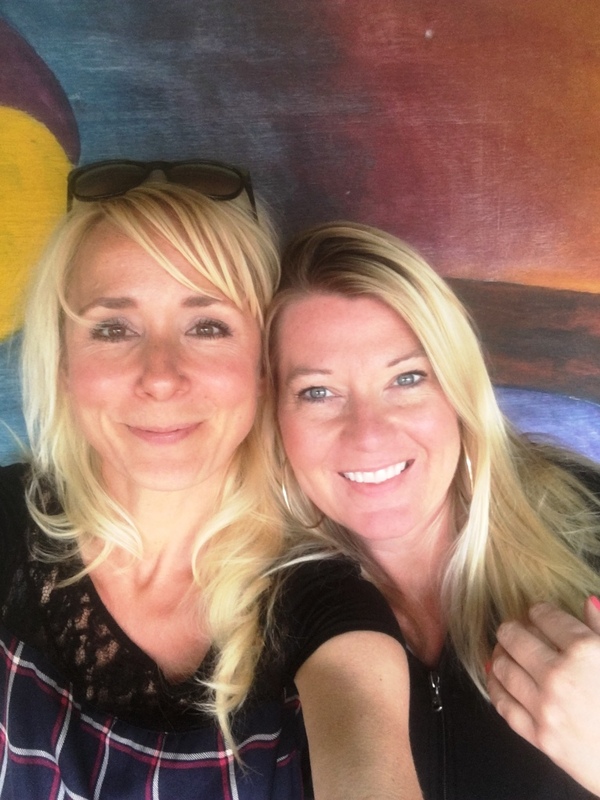 I am always so grateful to grab time with this woman. She lives in Colorado now, not far from Jocelyn. Needless to say, we have some fun activities planned for my next drive up. I love you Jen!! Thanks for sharing your heart and your cake. 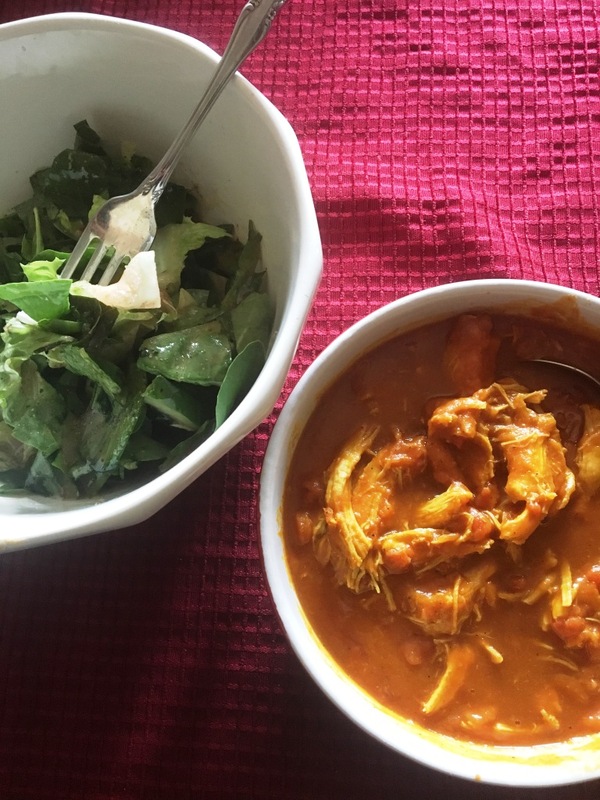 Real quick, five meals that made me feel great this past week. I do not “meal-prep” in the traditional hashtag sense of the word, though I admire those of you who do. How fun to see what other people eat, especially folks with similar goals and lifestyles. 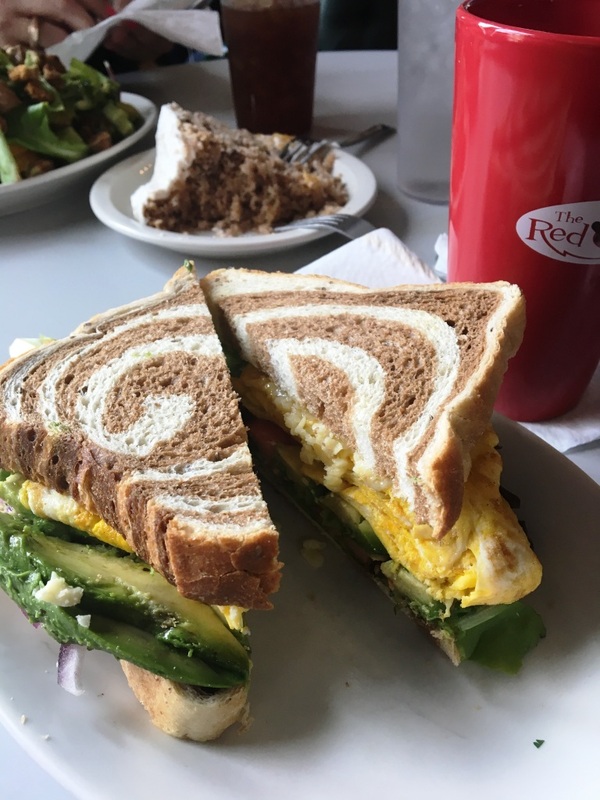 For us, I just plan loose menus aiming for as many vegetables as I can find, some lean-ish protein, eggs, fruits, good grains and cereals, and, okay, copious amounts of caffeine. Also popcorn. Close observers might notice a conspicuous absence of tortilla chips these days. Just an experiment to see I die from not eating them? 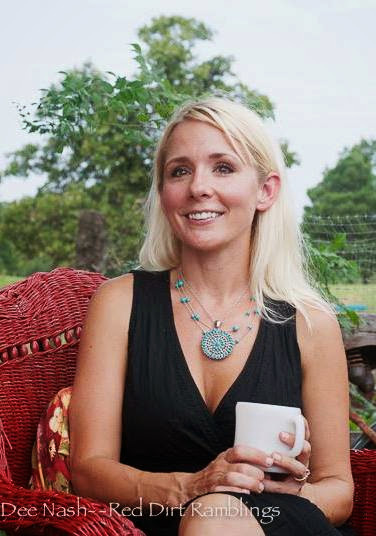 When I hydrate completely and nourish myself with just a little intention, I always feel better. Happier, more energetic, stronger for good consecutive days of running and farm chores, sleepier at night, comfier with life in general. Handsome feels better with good habits, too. He and I eat the same more than our friends might believe. I might eat slightly bigger salads than he does, and he might like potatoes more than I do, but otherwise? Like 67.814% the same. 1. 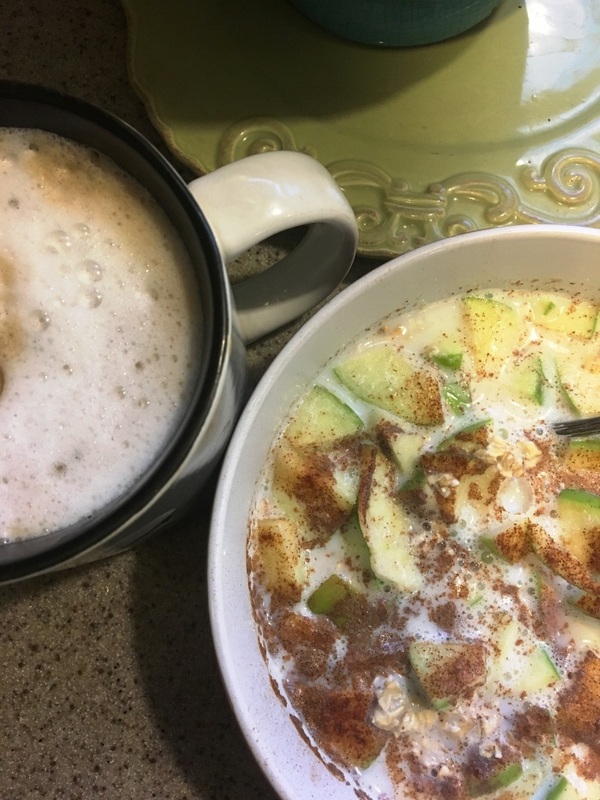 Apple Oats & Strong Coffee with Full Fat Half and Half, no sugar: I ate this late Tuesday morning after running nine miles, six with my friend Sheila and three solo. I was cold, wet, happy, and pleasantly depleted. I got home and craved something sweet. Normally I put runny eggs in my plain oats, but this day a Granny Smith apple was perfect. Loads of cinnamon. I was at max energy for hours. And behold the extreme volume of froth on that coffee, thanks to my $1.79 IKEA gadget. Obsessed. 335 calories, 68 carbs, 3 fat, 12 protein. 2. Roasted Broccoli with Quinoa, Lean Ground Beef, & a Parsley Mountain: A few cups of broccoli thawed and roasted, a nice sized patty of lean ground beef, and a hefty scoop of quinoa-wild rice mix. 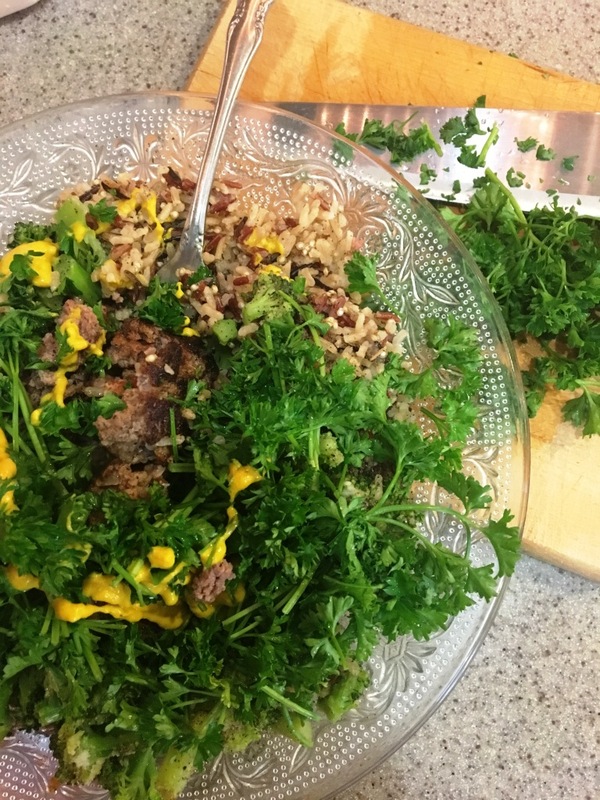 I smothered all of it with fresh parsley and added mustard instead of salad dressing. I was so full and content. 537 calories, 15 fat, 55 carbs, 53 protein. 4. 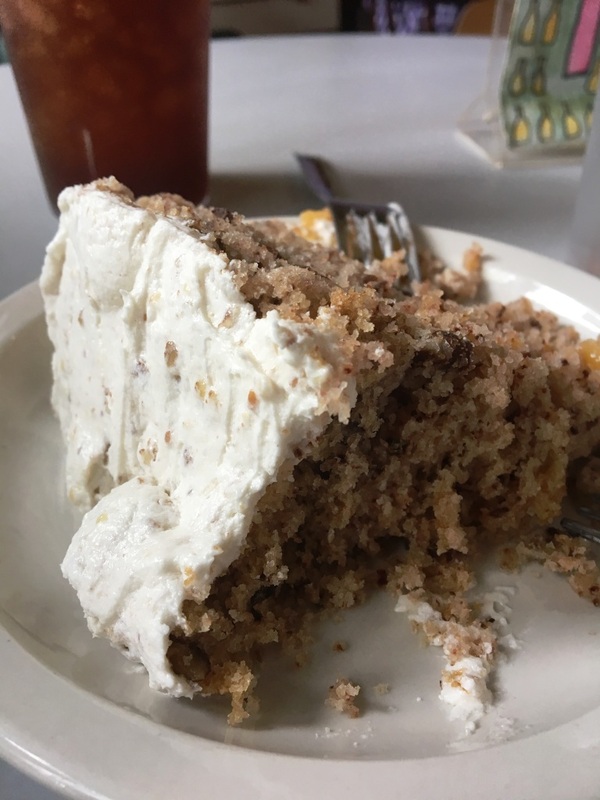 Vegan Peach Cake: Jen and I nibbled together on this cold, fluffy, nutty, fruity mound of indulgence in between updating each other on our lives lately, our hearts’ desires, and what books we both have read. We made this cake last a long while, man! And by the end of our two-hour lunch, still half of it remained on the plate. Not because it wasn’t good, because it was. It was just so dense. And we were both already so full from our actual food! Yum. 5. 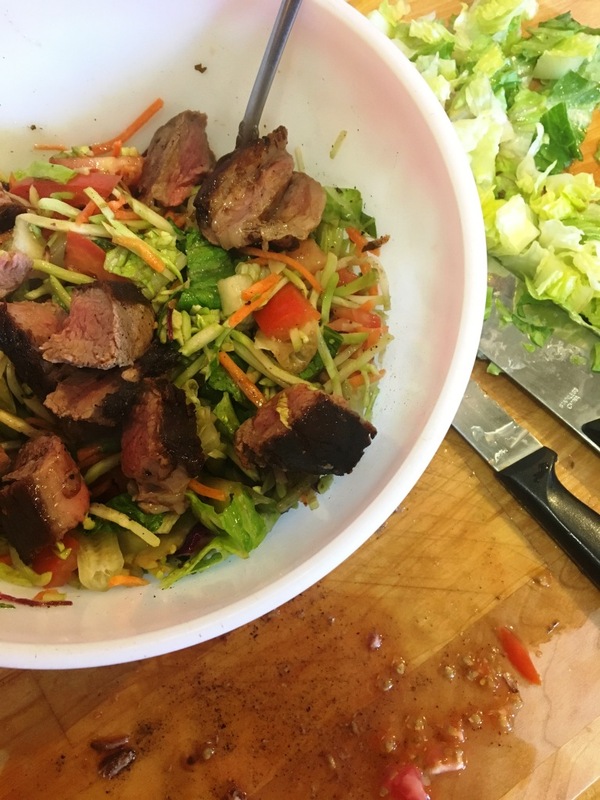 Green Salad with Broccoli Slaw & Sirloin: Have you ever tried a baggie of that raw broccoli slaw from the produce department? I grabbed one a few days ago for a great price and have to admit, I love the convenience. I recently saw the idea of using these tiny veggies slivers in a stir fry, which I will eventually do. So far, on a “big salad” night I just added about half a cup of it, plain and raw, to a bed of chopped romaine and tomato, topped it with several ounces of petit sirloin and some vinaigrette, and called it a huge win. I ate a big handful of “air-fryer” russet potato fries afterwards, too. Yum. 464 calories, 38 carbs, 15 fat, 42 protein. Food regrets this week? Nope. We were well fed and happy every day, for which I am grateful. I feel super fortunate. 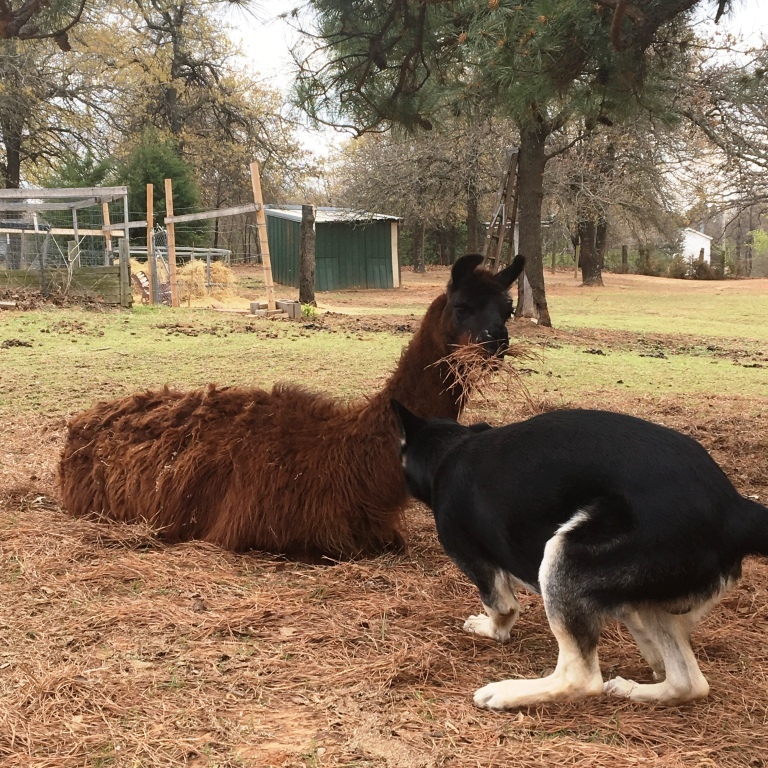 Let’s admire a llama instead. 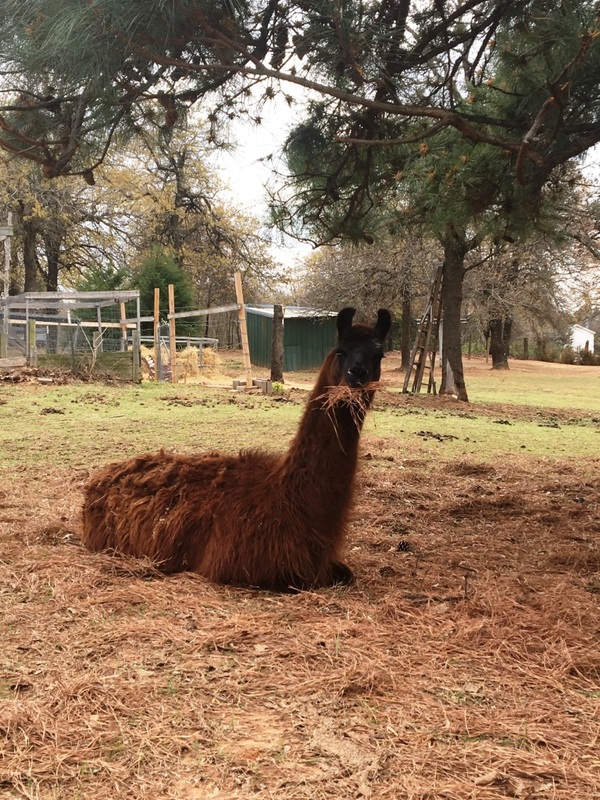 Meh the llama wondering why I take so many pictures of him. 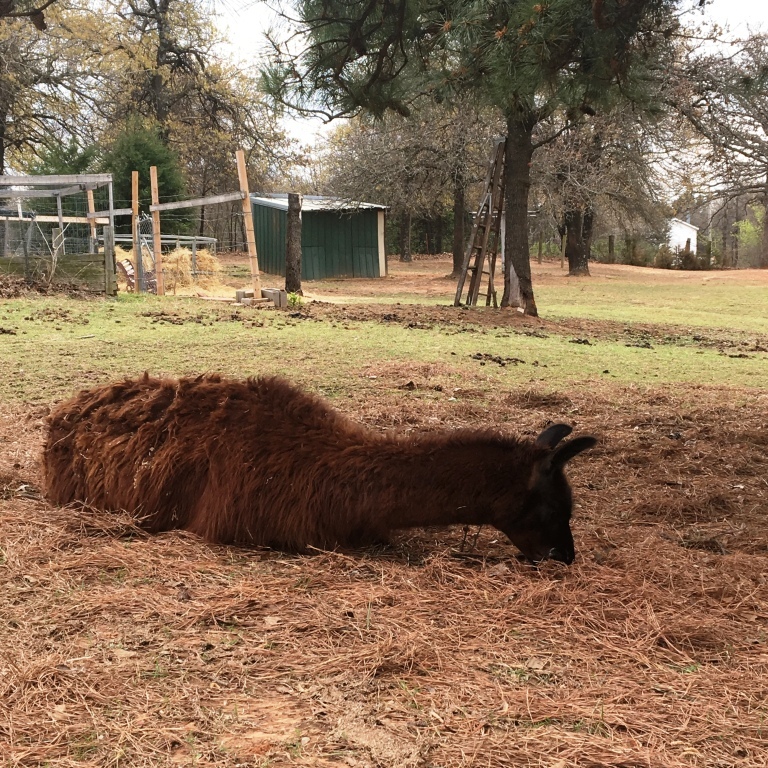 Meh returning to his lunch of dried pine needles. Klaus pouncing like a kangaroo to interrupt the pine needle lunch, actually having underestimated Meh’s agility. Yet again. The fight was short and sweet. Why is food so fun to talk about? Time for my long run! And then one already nicely assembled weekend about to launch. Gotta go.